BEFORE: Potpourri chain continues with The Patriot. This time Gibson stars and Roland Emmerich takes the helm. My previous two Gibson films, Braveheart and yesterday’s The Passion of the Christ leave me very optimistic for today’s film of choice. AFTER: As with anything by Roland Emmerich, you can’t go into the film expecting the full truth. Many of his films (see: The Day After Tomorrow, 2012, Anonymous) rely on heavily stretched truths and lots of creative imagination to create a film that may not have the most honest story, but most of the times will have an entertaining one. The Patriot has such a story. I found it very similar to Braveheart except instead of taking place in 13th century Scotland, it takes place in colonial America. 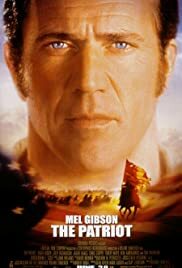 You have the central character, in this case Benjamin Martin (Mel Gibson), who after facing a great personal loss rallies the local townsfolk to fight against a common enemy, the British. It may be a boilerplate film, but nonetheless it is an engaging story filled with lots of blown off heads, amputations, and a fair share of flesh wounds. I’m no historian so I can’t speak to the depiction of events in this film. And if you’re going in looking for the definitive story of the Revolutionary War in the South, you won’t find what you’re looking for. If instead you go into The Patriot looking to be entertained by some colonial fighting and a gripping, albeit conventional, tale, you’ll be pleased with what you see.